Use your gifts to serve others in our community. Learn more about local ministries and missions opportunities. Know, encourage, and grow while seeing to it that no one falls shorts of the grace of God (Hebrews 12:15). Each year, church members, families, and friends dedicate one day to go Beyond Our Walls to serve the Roswell community. Financial and volunteer opportunities available. Provides short– term crisis housing, education and empowerment programs for homeless mothers and their children. Volunteer advocates are needed to work with mothers and children. Monetary donations and volunteer hours are welcome for upkeep on sponsored apartments. Partners with families who are homeless or at risk of becoming homeless by helping them get back on their feet so they can create a stable lifestyle for their children. First Baptist Roswell is a host congregation and in partnership with Family Promise, hosts families each quarter. Help transform the lives of homeless families and get involved. The food pantry at First Baptist Roswell provides non-perishable food and personal care items to families and individuals in need. The pantry is open every Tuesday and Thursday from 2pm to 4pm. How can you help? Foster Care Support Foundation serves a vital and growing need throughout Georgia by providing free clothing, infant equipment, and developmental toys to thousands of children in foster and relative care. Financial, mentor, and volunteer opportunities available. Special donation events throughout the year include Prom-A-Palooza and Angel Tree. A support group ministry to children whose families have been impacted by death. Groups meet for a six-week session in the Spring and Fall. Volunteers are needed to work with children. Each month, a specific mission program is highlighted for special giving. 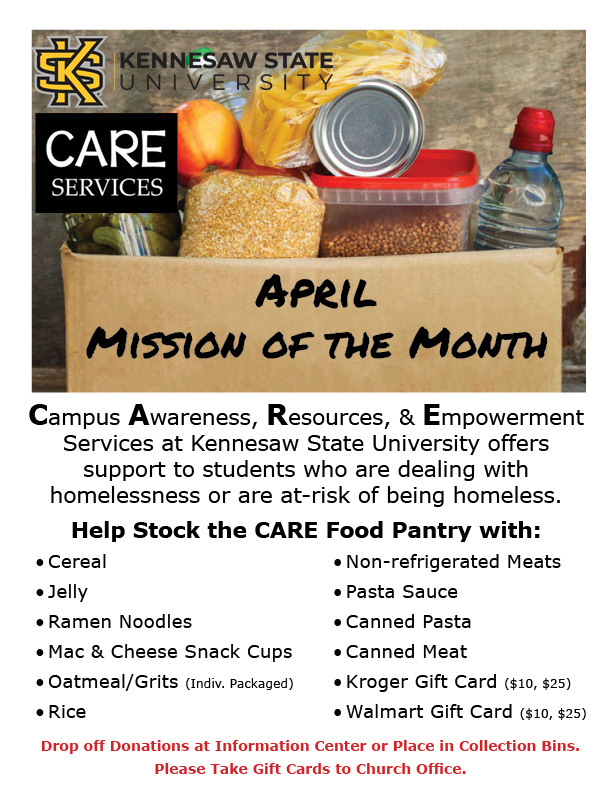 The Mission of the Month for April is Campus, Awareness, Resources, & Empowerment Services (CARE) at Kennesaw State University. CARE offers support to students dealing with homelessness. How can you help? Help stock the CARE Food Pantry! North Fulton Community Charities (NFCC) is dedicated to building self-sufficiency and preventing homelessness and hunger for residents living north of the Chattahoochee River in Fulton County (Alpharetta, Johns Creek, Milton, Mountain Park and Roswell). NFCC assists families with basic needs such as food, rent and utilities, clothing, and adult education classes during short term emergencies. Volunteer opportunities to work in the office, food pantry, thrift shop, and other areas. Volunteer to celebrate resident birthdays every 2nd Monday of the month.